The PureFlex 800 Series fully lined composite valve is manufactured to be corrosion resistant inside and out in hostile services. 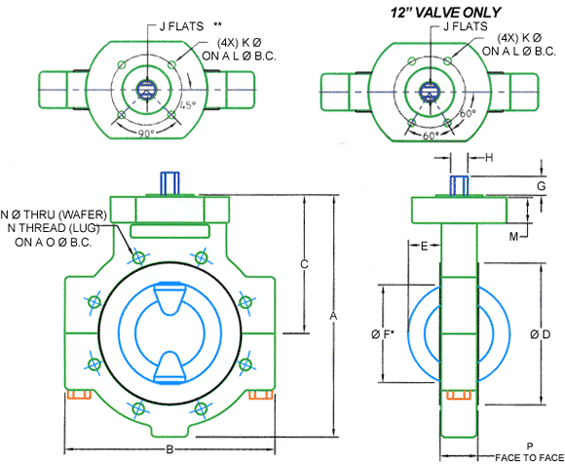 The valve has the strength of steel with ½ the weight and is 10× more impact resistant than standard FRP. They are used for shut-off and throttling of most known corrosive fluids, and have the purity required for ultra-pure applications. The 800 Series can be used for end of the line service and is bubble tight at full rated pressure of 150psi, has triple stem seals and can operate at temperatures of -60ºF to +250ºF. The 800 Series valve body is manufactured from Durcor®, PureFlex's proprietary advanced fiber reinforced composite. Durcor® reinforcing fibers are long and interlocked; this interlocked reinforcement system transfers loads throughout the fiber matrix making the 800 series valve body virtually indestructible. 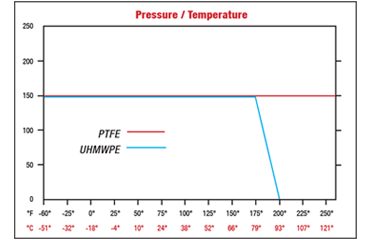 It has tensile and compressive strengths that rival steel along with outstanding impact resistance that is unmatched in the industry.The strength of Durcor® enables the 800 series valve to maintain ASME face to face dimensions, be direct threaded for lug design and allows it to be installed in any type of piping system without the need for special considerations. Durcor® excels in temperatures from -60°F to +250°F and has only .001” of thermal expansions across its full temperature range. 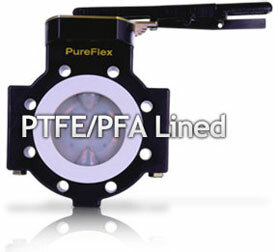 PureFlex 860 Series valves take resilient seated butterfly valve technology to the next generation in reliability. The valve is bubble tight at full rated pressure of 150psi, has triple stem seals for unmatched leak free dependability, and it can operate at temperatures between -60°F to +250°F (consult factory for higher temperature applications). The 860 fiber-reinforced vinyl ester valve body has a zero corrosion rate, the strength of steel with only ½ the weight, and is virtually indestructible. The 860 Series is used for shut-off, throttling, and the transfer of many corrosive and erosive fluids, and has the purity required for ultra-pure and food applications. Composite Durcor® valve body is light weight, provides maximum external corrosion protection, tensile and impact resistance. PTFE seat is .125" nominal thickness and is recessed into body, seat is energized by one piece non-wetted elastomer providing bubble tight sealing. Once piece 316 S.S. disc & Stem provides high Cv valve. blow-out protection and has double "D" shaft drive, can be lined with PFA / UHMWPE or unlined. Mounting Flange is ISO 5211 compliant. NPT connections (optional) for purge or leak detection, inert gas pad or sealing lubrication port. PTFE composite bearing (top & bottom) is self-lubricating, reduces friction and is maintenance free. Triple stem seals top and bottom. 304 S.S. coil springs keep preload on stem seal and taper ring. 304 S.S. tapered ring compresses energized PTFE liner onto locking barbs, creates tortuous no leak path. Locking barbs molded or machined onto disc stem. 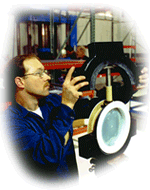 Stem seal is created through an interference fit as the stem is passed through the body liner. 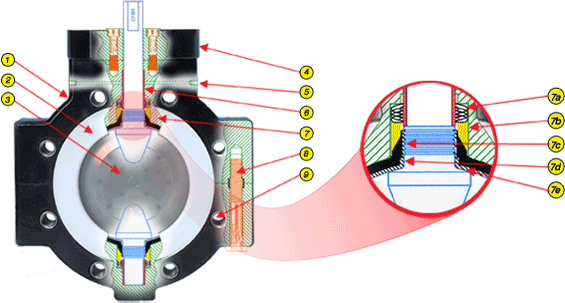 Primary seal is achieved at the disc hub and liner (ball & socket) through preloaded force. Bottom heavy hex fasteners eliminates exposure to leaks from overhead equipment, PTFE coated B7 standard. Other materials available. 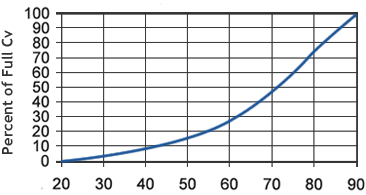 Flanged Wafer or Lug design with composite threads 250ft. pound pull - out strength. Alloy inserts also available. 2" 275 in.- lbs. 405 in.- lbs. 3" 380 in.- lbs. 463 in.- lbs. 4" 570 in.- lbs. 2,300 in.- lbs. 6" 1250 in.- lbs. 3660 in.- lbs. 8" 1660 in.- lbs. 4116 in.- lbs. 10" 3600 in.- lbs. 6915 in.- lbs. 12" 4800 in.- lbs. 8102 in.- lbs.